New consumers. More new gardeners will come from the Millennials (those that follow Gen Xers, roughly those born in the 1980’s and 1990’s), Hispanics, and Young Men categories. Millennials are a larger group than the Baby Boomers, comprising about 1/4 of the U.S. population, and spend about four times more on gardening than the national average. Young Men also spend more than average. Hispanics have a big interest in growing vegetables, which will drive this trend nationwide. Health. According to the trends report, health is a concern not just for individuals. “People aren’t just gardening for beauty, they are gardening to nourish their communities, the environment, and their own well-being.” Edible plants, such as berries, will remain strong. Included in popular products will be those environmentally friendly and safe for pets and children. People will be concerned with the effect of products on birds and bees. Plants will be seen as good for cleansing air, making oxygen, and overall wellness. More will learn that trees absorb 1/5 of carbon emissions, reduce electricity consumption, and increase mental health. Color. Look for “pops of exploding color like pink and teal”. Bubblegum petunia in turquoise planters are an example. Other popular colors should include rustic, natural palettes, light pastels, and worn-in hues such as denim. Garden-tainment. This means “the party is moving outside” as people enhance outdoor living spaces and personalize them, using them as an extension of indoor living spaces. Look for ready-to-go plants for instant effect in such spaces, grilling and cooking outdoors, and all manner of containers. The majority of younger consumers (Millenials and GenX) rated such outdoor rooms as important or very important. Compact yet bold. 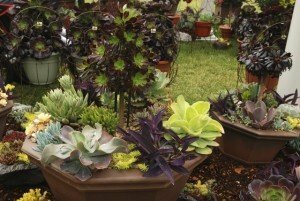 Compact plants and containers with bold plants to make a quick statement will be popular. Larger decorative containers will be seen more. Tiny succulents, being attractive and easy to grow, will remain popular. Portable gardening. This caters to an increasingly mobile audience. The word “NOwners” has been coined to refer to “those who prize freedom over home ownership” (or perhaps just rent or can’t afford to own a home). Look for more lightweight and adaptable planters with wheels, handles, and moving parts that make them both decorative and mobile. Neighborhood rebels. You probably won’t see this trend as much in rural areas, as it refers to residents of neighborhoods and planned communities rebelling against ordinances that limit their freedom. It’s estimated that over 63 millions Americans lived in over 323,000 such urban communities. These folks are transforming neighborhoods into “agri-hoods” with urban chickens, bee keeping, clotheslines, food gardens, and landscapes without lawns. Garden naturally. Increasingly you may see this landscape style which could be termed “anything goes”. It is a casual style, of really no formal style, inspired by the natural landscape. Look for more “meadows and natural habitats using native plants to increase diversity, balance, and ecosystems.” Being adapted to local climates, native plants need less water and fertilizer and pampering, and support healthier ecosystems (like bugs for birds to eat—a main part of their diet). Smoke your garden. This last trend relates to almost half the states passing laws legalizing marijuana. The trend group expects more people will begin growing their own. While you may not see plants and seeds just yet in stores, you may see more growing lights and supplies—all useful for growing your own seedlings and houseplants indoors too.